1. Tell us about the journey that brought you to India and led to the concept of Tia Pakhi. It all started on my first visit to India in March 2006. After my training in fashion and textile Design in Paris at LISAA Institute, I found the opportunity to come and work as a designer with a textile export-house in Kolkata. Although I had read many books to inform myself about the country and culture I was about to visit, I still could not imagine what I was about to step into : a world full of creativity, joy, energy, hospitality and such a rich culture. I felt immediately at home in the city. Through my work which was to create designs for embroidery for the European market, I discovered a new medium and so many new techniques and was fascinated by all the possibilities to explore. From that time I discovered Kantha embroidery which caught my eye. I started to develop few samples for my portfolio with local artisans a friend had put me in touch with. The first seed was planted. After this experience, I went back to Paris to pursue some further studies in Management and marketing specialized for the textile and clothing industry as I was thinking of the possibility of creating my own business in the future. As my work experience during this Masters program, I worked for a fashion company called “Madame A Paris” based in New Delhi on production developments, follow up, quality control etc. This experience gave me more confidence to deal with suppliers and the whole logistics of production in India. It is in 2010 that I finally came back to India to settle down after marriage. It is then that I started working on developing my own collection of products and finding artisans to work with. TIA PAKHI was launched in India in January 2012. 2. What is it that drew you to kantha embroidery? What is it like working with the crafts people in Kolkata? I was drawn to Kantha embroidery from my very first visit in Kolkata. I love the simplicity of the stitch yet so intricate. It has a humble touch and brings warmth and texture to the fabric ; the feel under the hand is lovely. It also somehow reminds me of when as a child my grandmother taught me to do my very first hand-stitches. I use the embroidery almost as a print. The stitching adds depth and vibration to the patterns. Making contact with artisans has not been an easy thing in the beginning. First of all I went through the process of learning the language to be able to converse directly with them and explain my ideas. Then selecting a reliable group of artisans which could deliver the quality I was expecting. It was quite challenging in the beginning to change the usual pattern of work of the craftsmen and get the results I was looking for. My dedication to one technique has helped to develop a relation with them and get their personal interest in this new style of work. My objective is to present Kantha with a fresh new look and make handcrafted products reach the homes of a more diverse clientele. Hence the craftsmen can keep their craft alive and find opportunities to develop their skill and their economic situation. 3. 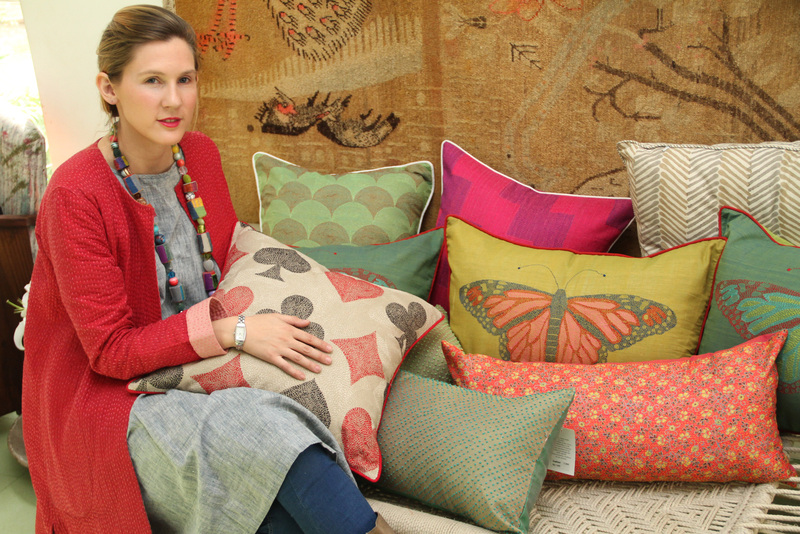 The colours in Tia Pakhi products really pop, bringing the embroidery alive with the funky ‘I Love You’, butterfly and rose designs. Tell us a little bit about the inspiration behind your work. In India I could say that I am constantly stimulated creatively, especially in a city as vibrant and colourful as Kolkata where the traditional culture is still so present in urban life. People, markets, festivals, architecture, food, everything… all around that’s calling you. But travelling is something really needed for inspiration, to open your mind to new ideas or ways of working. I think creativity is taking ideas from various places and putting it altogether by combining them with your own personality. In traveling one gets so much inspiration in terms of colours, forms, products, lifestyle, ambiences. Nature has always been a main source of inspiration for me : there are uncountable textures, patterns, forms and colour combinations in Gods creations. One just needs to look around and observe. I like to keep my motifs minimalistic in order to enhance the intricacy and the quality of the handwork and play with different colour combinations. Colour plays a very important role in my life and work. I love to search for different combinations endlessly. 4. What is the story behind the name, ‘Tia Pakhi’? As I am reviving a craft from Bengal I wanted a Bengali name for my label. TIA PAKHI is the bengali term for the green parakeets which used to fly across the city. It is something rare to see now and the parrot also evokes a sense of exoticism and travel. TIA PAKHI was also a Bengali word easy to proounce in many languages and also could pass as a designer’s patronym too. In fact I do receive email addressed to me as “Dear TIA PAKHI ” which amuses me and shows me that it does work. I like this contrast of simplicity and sophistication. 5. The Tia Pakhi line of clothes & home textiles effortless blend East & West. Can you share your views on contemporary Indian style? India has so much to offer in terms of crafts, there is so much beauty in this country. I belive that contemporary Indian style should be using traditional techniques and adapting them to a more modern lifestyle. The crafts are part of the identity of this place and we shouldn’t let it die. With TIA PAKHI one of my aims is to develop into people a taste for the handmade and to make them rediscover the soul of a handmade product. I think that the contemporizing is in the use of a wider colour palette, and my choice of patterns but also the variety of products I apply this technique to. I take special care in keeping the best finish possible to the final products to give justice to the hard work of the artisan. The idea is to create products which are hand crafted yet fit in a modern and sophisticated lifestyle. My goal is that people who wouldn’t initially have an appeal for hand made products would pick TiaPakhi products for its colour, design and practicality. 6. In what way does your French origin influence your design? 7. How was your showcase at The Amethyst Room at Chamiers recently? First of all it is such a beautiful place to display ! My showcase in Amethyst had a great response and it was a pleasure to work with the whole team who was so welcoming to me. I was very pleased to be there personally and interact with the customers and explain my work. I guess that kantha embroidery is less seen in other parts of the country and hence people took a real interest in it. 8. What’s next for you and your label? I wish to continue spreading the good word about Kantha embroidery and giving pleasure to people through more exhibitions in other cities. And I’m also working on setting up online retailing for TIA PAKHI from my website : http://www.tiapakhi.com.